November 21, 2016 – The Flushing Remonstrance of 1657, a precursor to our own First Amendment protections of religious liberty. The Spaldeen we discussed in Geoff Griffin’s Brooklyn Bat Boy: A Story of the 1947 Season that Changed Baseball Forever. This week, New York Times Urban Affairs Correspondent Sam Roberts puts some serious miles on our Time Machine, and fills its trunk with the everyday objects that defined Gotham since it’s earliest, pre-colonial days. Bagels. Subway tokens. 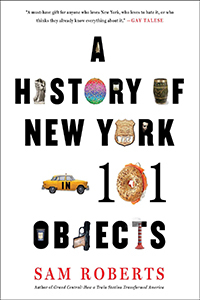 His book is A History of New York in 101 Object s, now in paperback. And like the city itself, the book is an ongoing conversation. Sam Roberts encourages readers to email him at ObjectsOfNYC@gmail.com to argue for their favorite object, or against something he already included. Who knows? Maybe your object will be among the next 101 that define Greater New York. You can catch Sam’s columns in the paper, follow him @SamRob12 on Twitter, or check out one of his eight previous titles including, Grand Central: How a Train Station Transformed America .